The world of consumer electronics is not for the faint of heart. A company comes up with a brilliant new product that suddenly gets enormously popular but then before you know it, the next big thing arrives and the previous market demand evaporates. Exhibit A - just a few years ago, netbook computers were all the rage right up until the moment Apple launched the iPad in early 2010. Closer to the garage, Apple also triggered disruption in how we find our way to our driving destinations. Earlier in the last decade a new generation of smaller, cheaper GPS receiver chips made low cost personal navigation devices (PND) a very popular replacement for old school paper maps. When the first iPhone came to market in mid-2007, it ushered in an era of new smartphones with built in GPS. One of the first apps on those iPhones was Google Maps. At first Google Maps was limited to showing your current location on the map helping users to find their way around in unfamiliar places. It wasn’t until November 2009 when Google launched version of 2.0 of its own Android mobile operating system on the Motorola Droid that the end-times arrived for the makers of PNDs. For the first time, the new version of Maps included full turn-by-turn directions capability just like a PND and it was free of charge. Since then, a wide array of free and low cost navigation apps have appeared for both the Android and Apple iOS platforms with Waze being one of the more interesting examples. Google creates its own map database from a variety of sources including its fleet of Street View cars that are driving around the world recording and photographing the world’s roads. Waze on the other hand relies primarily on its community of users to produce maps and provide real-time traffic data that is shared with the entire community. Warning: Tin-foil hat types that worry about being tracked everywhere they go probably should not use Waze. Actually, if you are that concerned about being followed, you shouldn’t even be carrying a mobile phone but that’s a whole different story. Follow the break to see more about Waze, and to get a download link for the application. When Waze is running on your phone, it is constantly sending back breadcrumbs every few seconds to the server with your location, direction and speed. By aggregating information from users in real-time, Waze can then provide the rest of the community with alerts about upcoming traffic backups. The advantage of this background reporting is that the driver doesn’t have to do anything that distracts from the task at hand. But Waze also provides a mechanism that allows users to easily report accidents, hazards such as cars on the shoulder, construction zones and police speed traps. 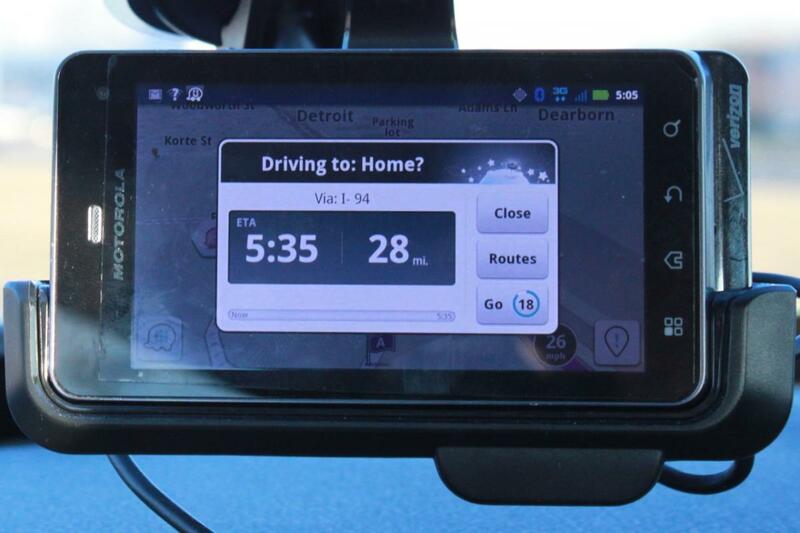 Version 3.0 of Waze was released just before this review was written with a revamped user interface. The UI now has a button right on the main screen that allows drivers to make reports with just a couple of taps on the phone screen using a menu of large colorful icons. 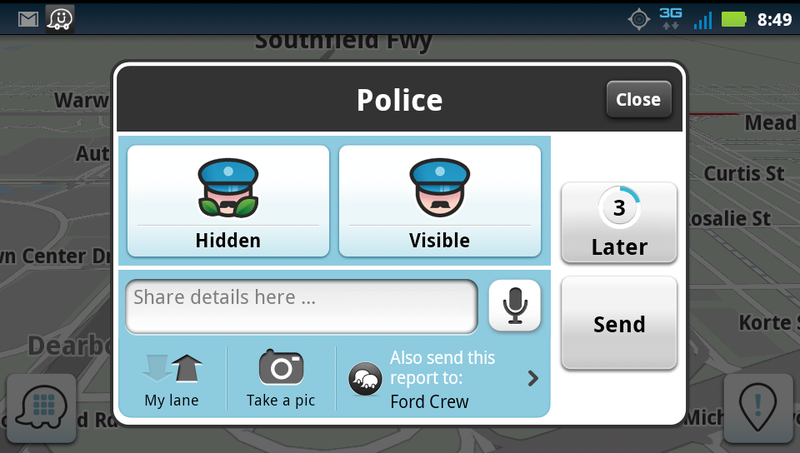 The app records your location at the moment you hit the report button for automatic uploading. The trade-off for agreeing to share your data with the community is an incoming stream of fresh alerts about what you will soon encounter. Reports of a stalled car or waiting police cruiser ahead trigger automatic warnings that pop up on the screen. 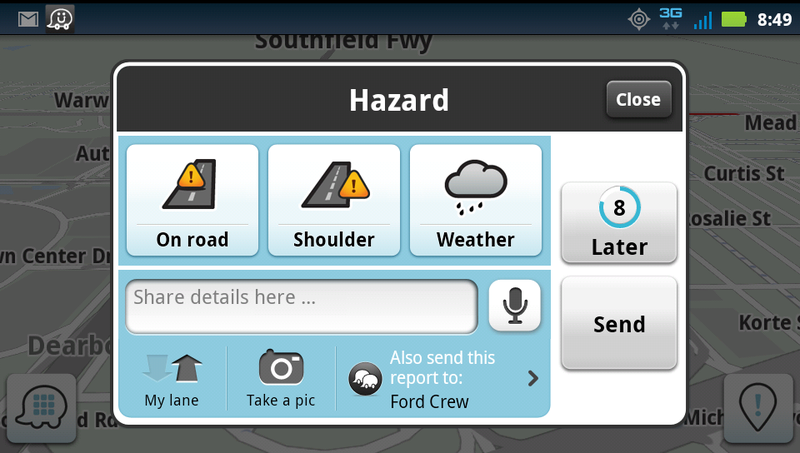 You get a brief message describing the hazard along with a thumbs up and “Not There” buttons. 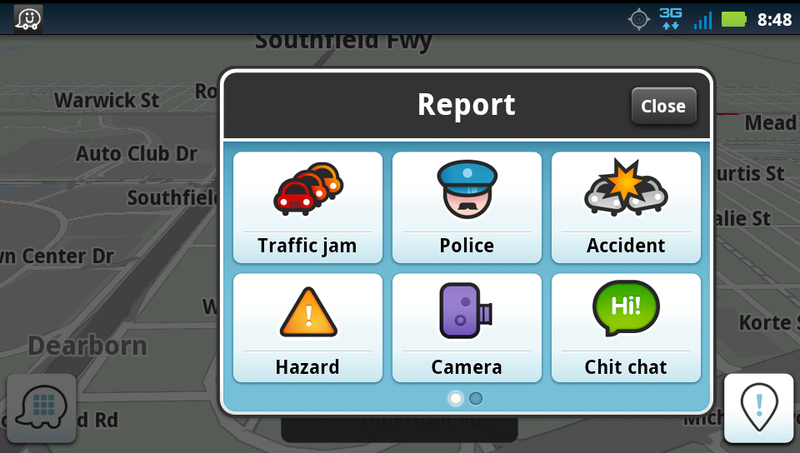 If the warning is accurate or still relevant, tap the thumbs up to let Waze know. If whatever had been reported previously is gone, tap “Not There” so that Waze can stop sending that alert to other users. At anytime you can pull up a list of alerts in your area or along your navigation route to see what’s coming up. When you are stopped in traffic or at a red light, the current list of nearest alerts will cycle across the screen so you can quickly determine whether to take an alternate route. You can also check out a live map at the Waze.com site before you leave. The navigation function works much like most other guidance systems. The new 3.0 interface looks more grown up and less cartoonish than early versions. Users can select between 2D and 3D perspective map views and pick different color schemes. 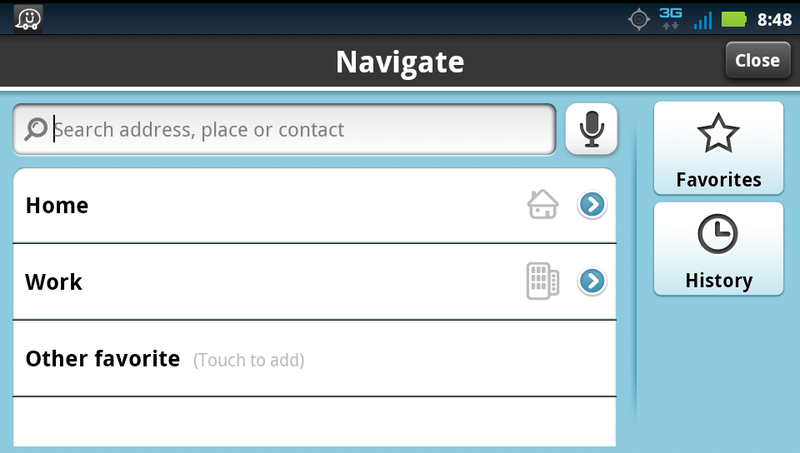 Destinations can be entered by typing or on Android devices by voice input. One of the big advantages of Google Maps navigation over other dedicated systems is its access to the search giant’s entire web index for points of interest. 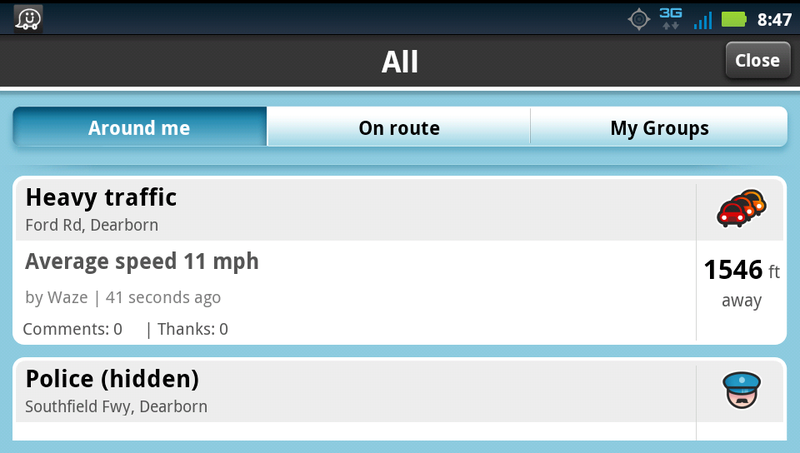 The data available to Waze is not quite as vast but its growing all the time. Version 3.0 added integration with Yelp and Foursquare to expand the list of places users can find along with the associated reviews and recommendations. As with most guidance apps, Waze allows users to save favorite locations with two slots reserved specifically for Home and Work. The advantage of these special slots is that depending on the time of day and your current location, the app will take a guess at where you might be headed as soon as it is launched. For example, when leaving the house in the morning, I put my phone in the dock and start Waze and it immediately pops up and asks if I am driving to work. If I don’t tap close before the countdown timer ends, it assumes that’s where I’m headed, plots the route and pulls down traffic alerts. The whole process works in reverse when it’s time to head home, all very handy. Waze automatically calculates alternate routes to a destination that can be selected with just a couple of taps on the screen. The app does keep track of your driving habits and if you regularly follow the same route from one place to another, it will set that as the default route. Perhaps the biggest downside to factory built-in navigation systems is outdated maps. For older systems that rely on DVDs for all the map and POI databases, dealers are typically happy to charge you $100 or more for a new set of maps every year. Phone based systems like Google Maps, Waze and others download maps on the fly as you use them so you always have the latest information that the vendor has on hand. Waze relies on the data being provided by its users to supplement its maps. When a Waze user encounters a piece of pavement that’s not on the map, they can tap on the Pave button on the Report menu in the lower right corner of the screen to start a recording of their track as they drive. Once the users stops and saves that recording gets sent to the Waze servers. The user can then log Waze.com account on a computer and check their list of recent routes to edit the map and add directions for one-way streets as well as street names. Users can also go in and edit known errors on the map. Unfortunately Waze has no analog to the very useful Street View that pops up in Google Maps when you arrive at a destination. One potential downside to Waze and most other phone-based navigation apps is that a data connection is needed to get guidance and alerts. With cell carriers increasingly clamping down on data usage, this could pose a problem for users on capped plans. 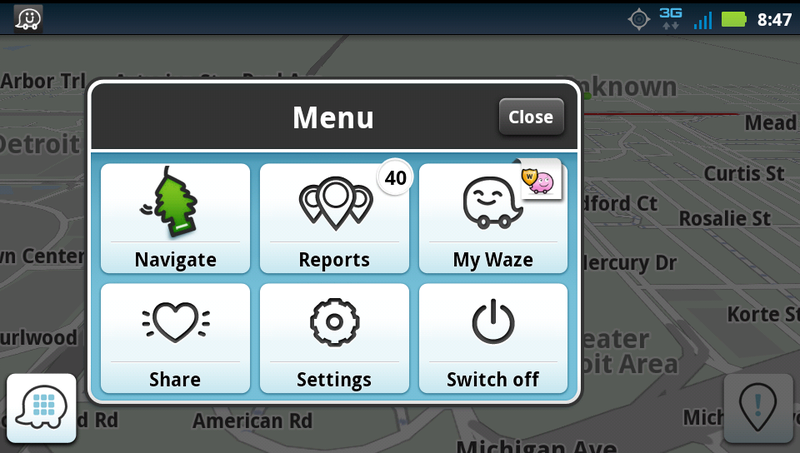 Waze users can check their data usage in the app settings and also enable data compression. Waze actually does a pretty good job of minimizing data transfer including varying the amount of detail shown based on your speed. As you travel faster on highways, the map view zooms out and shows less detail in adjacent areas. As you approach an exit where the guidance is suggesting you get off the highway, the view automatically zooms in and shows more detail. Smartphone users looking for either a free navigation app or just a means of getting live traffic and hazard alerts, Waze is definitely worth checking out as long as you aren’t on one of the newer minimal data plans with caps of 250 MB or less. There are versions of Waze available for iOS, Android, Nokia Symbian, Blackberry and even some older Windows Mobile devices. Users of the Windows Phone 7 devices are out of luck for now.